Opposed to the burlesque is the tragic. 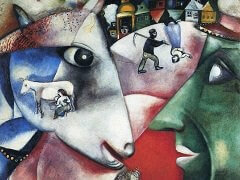 Franz Meyer records that Chagall, referring especially to Clowns at Night, has noted that painting is "a tragic language." 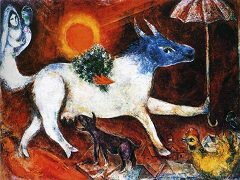 In a foreword to Fernand Mourlot's catalogue Chagall Lithographs of i960, the painter enumerates the themes and ideas that colors have suggested to him during his artistic life, and pensively concludes the list: "... and, with old age, the tragedy of life within us and around us." The elegiac mood permeated the years in Vence as a melancholy and slowly intensifying undertone, and increasingly produced pictures of a somber coloring. 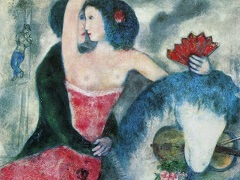 Chagall had always been fond of the nocturne, with the colors tuned to a minor key, and now it became the favorite motif; distinct from dramatics and despair, the mood is one of gay sadness. The emblem it carries on its banner, as Paul Klee once wrote in his diary, is "the merrily hopping tear." 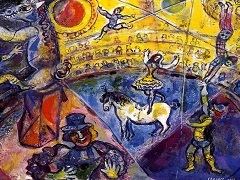 The picture here shows circus folk and artistes. Discharged from the transient brightness of the arena, fallen from the dazzling instant of artistic achievement back into obscurity, the procession of illusionists wanders across the dark field under a stormy sky. A bleak hut squats under two sinister moons. The leader of the procession, a pale young violinist with lost eyes and a face like a tragic mask, looks across at us; he stares at us steadily, bending his ear toward his girl companion, who accompanies his violin tune with the darker tone of the flute. A bird-headed figure in clown costume, hardly distinguishable in the darkness, carries along a girl singing at the top of her voice. 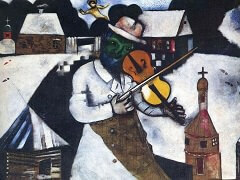 Her white face suggests she belongs to the spectral world of the violinist, to whose tune she is singing. A small group of singing and playing girls provides the chorus. One of them carries a faintly gleaming spray of blossoms, which, according to her glance, is meant for the pale violinist. So the forlorn troupe plays on through the sad, phosphorescent, moonstruck night, and only in its own music finds a spot of warmth. Without question, the picture is of psycho-biographical importance. 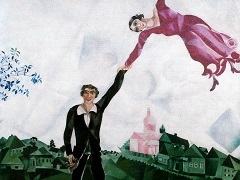 Chagall has always looked upon the life of the artiste as the image of his own humanity and of his personal "impossible task," as he likes to call it. He has always felt a deep brotherly affection for the figure of the tragic clown stumbling through life's mysteries and shadows - represented for him for many years by Charlie Chaplin. 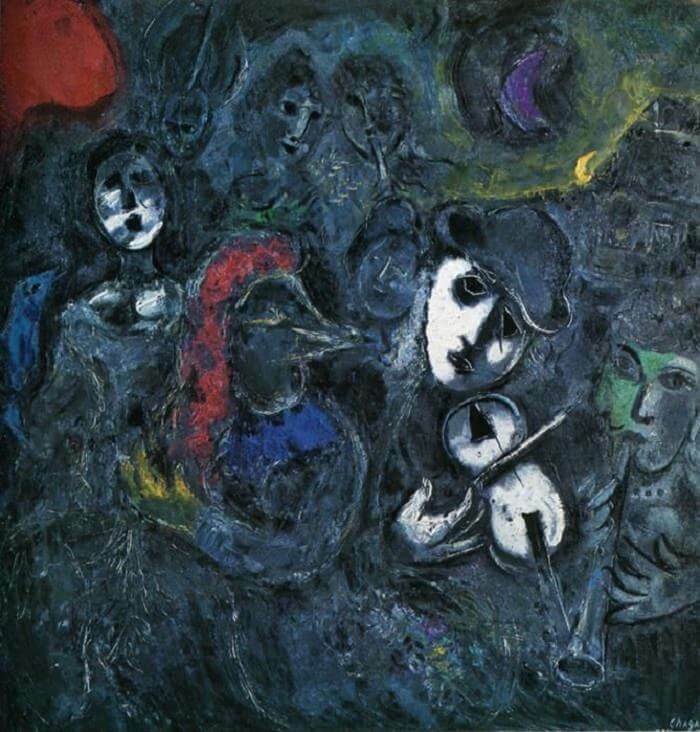 More than anyone else, Chagall knows about the dark hours of the artiste, and in allusion to these the metaphor of the Clowns at Night came into being.